Google Maps suggested walking in a strange loop out of our way, instead I insisted we cut a path straight to where it should be. And it wasn’t there. It was not quite 11am, which is opening time, so it was possible it was one of the shops that still had the corrugated iron blinds down. Using my own special dialect of Cantonese*, I asked a nearby shopkeeper and was rewarded with comprehensive instructions*. Meanwhile, Lady Devotea and our two companions looked a bit dubious. Around the corner was a small office tower, and as we passed it, I managed to translate “Phoenix Tea” by dint of the fact that it was in English. The Tea House is in the tower? Yes, the appellation 2/F was next to it. We entered the tower and it contained a desk with a very small but tough looking security guard/concierge, and a board that confirmed the Second Floor location. So, we elevated to the second floor. Hmm, checking our watches, it was just one minute past opening time. We peered inside, but nothing. We waited. A whole five minutes. Google said it was open today. None of the signs on the door that were in English mentioned it not being open i.e. one sign. The 45 different posters with Chinese characters may have alluded to it. I thought of calling Michael J. Coffey in the States and sending him photos of them all, but that seemed a bit of an imposition in the middle of the US night. So, I went down to see the security guard/ concierge/ information service. She had more English than I had useful phrases in Chinese, because quite frankly “lovely eyebrow”** or “big red robe” don’t help, but she understood, and she sprang into action, reaching for her walkie-talkie. She shouted at it for some minutes, pausing only to be shouted back at by an unseen correspondent. From the shouting, she managed to discern, and convey to me that Phoenix Tea should be open, and that the denizens of said tea house were running late. I re-elevated and shared this information. As we didn’t know how long we were to wait, we decided to put a ten-minute limit. Barely a minute later the security guard/concierge/information service/tea house apologist sprang from the elevator with information. It was not actually useful information, but well meant. I assured her that we knew this; but she looked dubious that our party of 50ish to 80+ year old English and Australian people might actually want this. But having done her duty, she departed. A few minutes later, the elevator opened and the proprietor of Phoenix tea, a Ms. Fong, arrived. She looked surprised and mortified. She explained that her bus had been late. We assured her it was fine. She asked if we wanted to do tea tasting. And we did. Here’s how it works. You can have a guided tasting, with another lady who hadn’t arrived yet, or a bit of a DIY. We chose the latter as it was the only option on offer. Ms. Fong explained it all to us, and quite frankly we didn’t get it, so we just kind of improvised. You choose a tea or a set of teas. You get all the equipment for a GongFu service. I could not work out from the menu whether the prices were per person or per table, so I eliminated a few options as the price might be painful. I also eliminated all greens, whites and oolongs. Why? Though Lady Devotea and I might well have enjoyed them, our companions were used to black tea, in England, and this might be a bridge too far. So, that left Lapsang Souchong and a high quality black from Fujian. As Lapsang can cause riots/murder/civil unrest, we just asked to have four portions of the black. Our guide said we would get more that 10 steeps of each portion. Personally, I doubted it. But over the next hour or so, we steeped one portion nine times. And it was excellent, from cup one to cup whatever, at two or so cups each per steep. There’s not much more to say, I had the other three portions bagged up, and as I sit typing this on a plane, I can see them poking out of my man-bag. 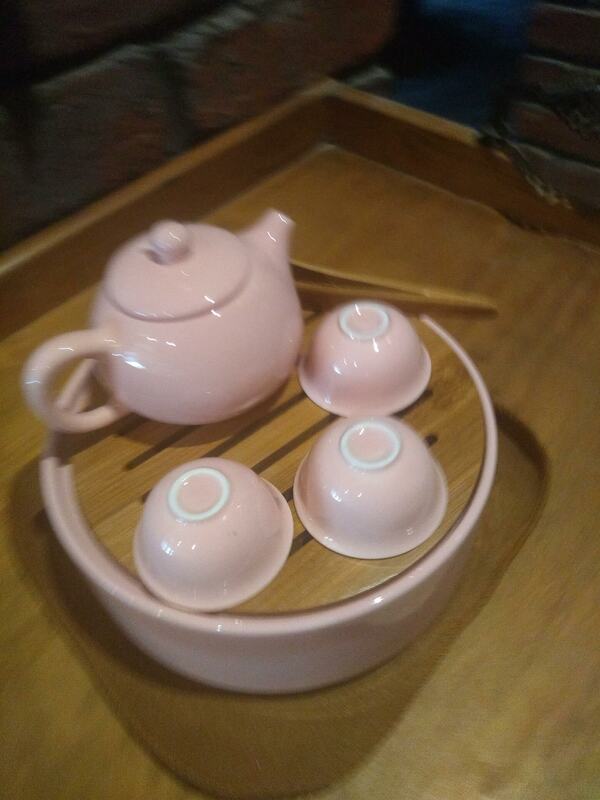 I looked through their extensive range of tea ware and bought something that might surprise you: A pastel pink travelling tea set that is destined to assist us in drinking that tea and remembering that morning. Lady Devotea spotted it and insisted, and how right she was. In a place none of us had ever been, in the company of an excellent if flustered host and a lovely off-sider, who was Japanese but had some English, we had partaken of great tea but also the truism that tea is at it’s best when it is in the company of people who are dear to you. It was an experience that was entirely novel to our companions, but they found it really interesting and it was something they might not have done on their own. Interestingly, it was the day after our visit to the Tea Ware Museum (I assure you our itinerary was democratically laid out, it wasn’t all my choices, even if it sounds like it). At the Museum, we had seen several videos on the GongFu method, so it was a great sequence of events in that regard. Our visit in 2017 to Phoenix Tea House in Burien was made special by the presence of those we were with and likewise this time, so with that being a factor both times, I guess I could be asked which of the two unrelated tea houses I though was the better one. It’s a hard choice. I need to say my choice would be Hong Kong by a whisker, but let me also say – and this important – how much harder it must be to do this in the USA than Hong Kong – and the experiences were not all that different. I mean that as a compliment to both. The entire time we were there, no other customers turned up. And yet, when we went back to street, two doors up was Starbucks and it was heaving. Starbucks? Ironically created just a few miles from the Phoenix of Washington State, this ghastly chain of horrible coffee and worse tea is trendy, and full of bright young things and the young at heart spending their cash on grande lattes and frappachinos that are pedestrian and raggedly flavoured. And so, I enjoin all my readers to round up friends and family and take them to tea houses. GongFu. Afternoon Tea English Style. Hipster Tea joints. WuWo tea groups drinking in the park. It doesn’t matter. Do it all. In Australia, speciality tea has gained a few points on coffee lately. This is the best news, like a Phoenix, let’s all help tea rise again. * I pointed to a picture of the tea house I had bought up on my phone and she pointed down and around the corner. Linguistic excellence all ‘round. ** Unfortunately all of the Chinese phrases I know are names of teas.